Africa is a sought after ecotourism destination due to its rich biodiversity and unique culture, and more people want to experience this natural beauty without destroying it. However, since the environment is now a forefront societal issue, many travel businesses market themselves under “ecotourism” as another way to pull in more money without actually embodying those values into their business model. These companies might look promising on the surface, but a little extra digging will expose their true colors. Clearing the Air: What is Ecotourism Anyways? In order to recognize these false ecotourism claims, it’s important to first understand what true ecotourism is. The International Ecotourism Society defines it as “responsible travel to natural areas that conserves the environment, sustains the well-being of local people, and involves interpretation and education”. Ecotourists typically visit areas that aren’t infiltrated by mass tourism in order to learn about the culture and support it by choosing locally owned programs and businesses. Minimizing negative human impact on the environment is a major factor, so both the traveler and the businesses chosen should practice being “green” through conscious efforts to conserve and reuse resources. The revenue from these businesses must remain within the local economy; meaning that employees need to be local as well. The environment wasn’t compromised to build the establishment. Food and other resources are locally sourced. Cultural tours aim to teach and integrate you into the culture; you aren’t just observing for entertainment and photo op’s. There’s an emphasis on exploring the environment without disturbing it. If a travel business doesn’t hit all these points, there’s a good chance that they aren’t a strong supporter of ecotourism even though they might claim to be. Africa’s wildlife is a sight that many travelers want to experience first-hand, and the vast national parks and conservation areas offer nearly endless opportunities to do so. However, while many safari tours seem to fall under ecotourism because they involve “harmless” wildlife viewing, they oftentimes miss the target completely. The development of roads that these safaris utilize disrupt the ecological system, and the high tourist volume puts unnatural pressure on the environment. As far as culture goes, the formation of these protected areas can sometimes force the locals off the land. This uprooting compromises the culture’s identity and ultimate survival in the worst cases. So, while visiting a nature preserve or wildlife conservation area seems like a sound ecotourism activity, that oftentimes isn’t the case. Again, the best way to find out the story behind these reserves is to diligently research it. Most travelers who choose to pursue ecotourism also practice sustainability in their everyday lives by shopping locally, living waste-free, and utilizing public transportation. While it isn’t technically considered ecotourism since you’re at home, many of the fundamentals overlap. If you aren’t familiar with ecotourism, try integrating the principles into your life to gain a deeper respect and understanding for it. 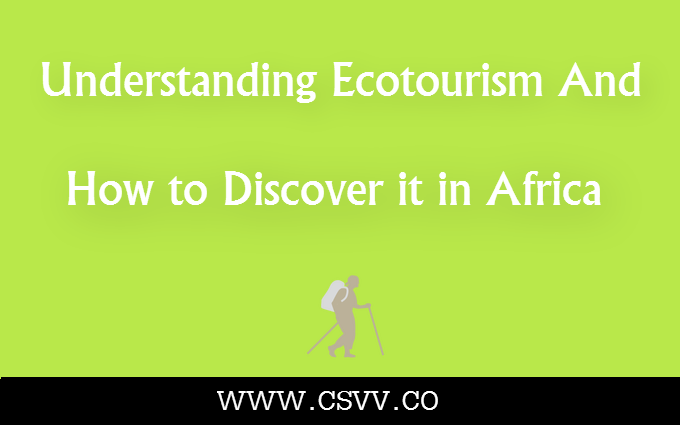 Legitimate ecotourism will soar in Africa and across the world by people fully understanding what it truly is, doing in-depth research, and living an environmentally friendly lifestyle. Ecotourism isn’t a brand name to be sold under, and a collective effort should be made to support the genuine businesses out there.